With Dipali Borthakur’s demise, not only did the world bid goodbye to a timeless voice, but also to an epic love story! Some of the greatest love stories go unseen, unheard and undocumented, simply because they’re ordinary couples living their lives. So this Valentine’s Day, we try to showcase such stories—everyday people and their extraordinary love! On December 22 2018, India bid adieu to Dipali Borthakur, the yesteryear singer from Assam whose mellifluous voice had captured the hearts of the people in the state throughout the sixties. A native of Sivasagar, Borthakur was relatively unknown when she won the first prize in a state-level singing competition in Dibrugarh in 1956. However, by 1958, she became one of the most popular female singers in Assam. All India Radio (AIR) Guwahati would broadcast her songs daily, and she became an indispensable presence in every cultural event in Assam. Once upon a time. Source: last fm. Some of her most famous songs include Xunor Kharu Nalage Muk, Joubone Aamoni Kore, Chenaidhon, Jundhone Junalite, Konmana Boroxire Sip, Senai Moi Jau Dei and O’ Bondhu Somoi Pale Amar Phale. Tragedy struck Borthakur when she was diagnosed with a rare motor neuron disease in 1968. The condition not only robbed her of her motor skills—by slowly degenerating her nerve functioning—but also her beautiful voice. Borthakur was only 27 at the time. While everyone was certain that it was the end for a rising star, the universe had other plans for Borthakur, specifically, love and one that would transcend all known boundaries and definitions. Shortly after the disease had taken control of her mobility and left her confined to a wheelchair, a young artist named Nilpaban Baruah walked into her life. Already a known name in artistic circles, Baruah had just returned to Guwahati after graduating from Shantiniketan with the dream of starting the Assam Fine Arts and Crafts Society. It was fate that led Baruah to spot this girl in a wheelchair, and his heart skipped a beat. Dipali and Nilpaban: A love transcending all known boundaries and definitions. Source: Magical Assam. “I first spotted her at her sister’s house and instantly fell in love with her. In 1976, we got married. My father never opposed my decision, as he could understand what love is being a poet himself. We never craved for anything materialistic, but only wanted peace and understanding,” said Baruah in an interview with The Times of India. 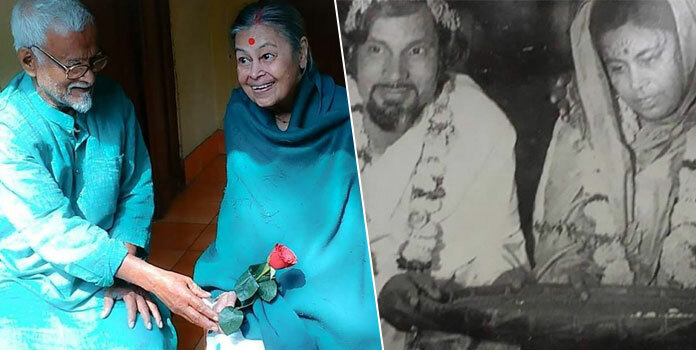 In a world where one’s value is gauged by their outer beauty and bank balance, Baruah’s selfless decision to marry someone whose condition kept deteriorating with every passing day is deeply poignant. For the next 43 years, Baruah spent each day taking care of Borthakur with unflinching dedication. From bathing and feeding her to managing the daily chores while taking care of her needs, it would only be poetic justice to call Baruah’s untiring devotion to Borthakur a beautiful artwork in itself. There was a time when the couple was facing severe financial difficulties, and a livelihood solely dependent on art in India wasn’t enough to meet their daily as well as Borthakur’s medical needs. This led them to find ways to earn their livelihood. Starting with a tea stall and then renting out rickshaws, Baruah and Borthakur were able to sustain themselves with dignity, before the state government finally took notice and sanctioned the xilpi (artiste) pension to Baruah. “Love is God, and there can be no substitute for it. Love is sacrifice and marriage is about maintaining the atmosphere of love in the house,” Borthakur had said upon being asked about love during an interview. You may also like: She Is My Girl: Kerala Man’s Poignant Gesture For Cancer-Stricken Wife Defines True Love! A feeling of anguish swept through the entire state of Assam when the news of her passing was announced, and after having spent an entire lifetime devoted to his wife, it would be impossible for anyone to fathom the vastness of grief that must have engulfed Baruah. With her demise, not only did the world bid goodbye to a timeless voice, but also to an epic love story.